That Never Happened had its Saskatoon premiere to a packed house on a bitterly cold evening . 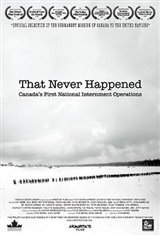 This profoundly moving documentary about the internment camps in Canada during the first world war traces this largely unknown story through the use of extensive archival material and interviews with the descendants of the survivors and their extended families . It takes great courage to tell these stories , and great sensitivity to respectfully share them with a larger audience .This film is a powerful educational tool , and it is my hope that this dark chapter of Canadian Ukrainian history will enter the curriculum of our schools. Brilliant work from a young director !